Christine Montague is a professional, award-winning visual artist, a polar bear painter, based in the Greater Toronto Area, Ontario, Canada. When polar bears were listed on the Species At Risk Act, Montague began her passionate journey of painting polar bears. 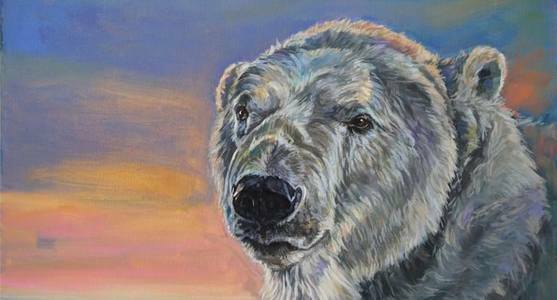 She uses her portraiture and realism oil painting skills, to document and celebrate the polar bear's character and spirit, its high intelligence (think great ape), and its survival in a world of vanishing sea ice. Through her travels to the Canadian arctic (Iqaluit & Cape Dorset, Nunavut) and subarctic (Churchill,Manitoba, Canada - polar bear capital of the world), Montague has furthered her knowledge on polar bears and climate change. In September 2017, "Dark Water 1", a painting of a polar bear in an unfrozen sea, took top award at the Canada wide Canadian National Exhibition Juried Show. “Dark Water”, Montague’s solo show of polar bears and climate change was exhibited at Toronto's Artworld Fine Art Gallery March - April 2018. Montague’s painting’s have been in over 50 art shows, many of them juried. They are in collections in Canada, U.S.A., the Netherlands, Great Britain, and Australia. 2018 Christine Montague "Dark Water" solo show opening. Polar bears in climate change art at Artworld Fine Art Gallery, 365 Evans Ave., Toronto, Ontario, Canada. 2018 Marty's Award Ceremony. Christine Montague is nominated for established Mississauga (Ontario, Canada) artist of the year. March 21 - April 3, 2018. Dark Water. Solo exhibit of polar bear & climate change paintings. Artworld Fine Art Gallery. Toronto, Ontario, Canada. December 2017. Polar Bear paintings Joy of Art. Williams Mill Gallery. Glen Williams, ON, Canada.